It is highly important to know, not only what functions there are in the application, but also how to efficiently apply them in studying a foreign language. If you have just started using WorkAudioBook it is advisable to read through Learning Methodology page. WorkAudioBook application helps you learn any foreign language by using audiobooks in this language! 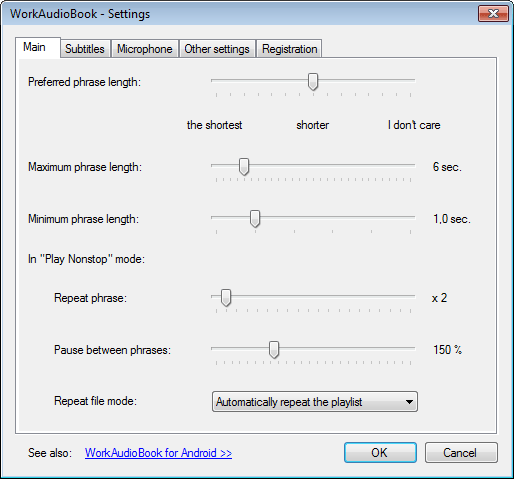 Automatic phrase selection and convenient repetition – these are tasks that WorkAudioBook does easily. Application will help you improve your foreign language skills by using any audiobook, podcast, audiotrack in MP3 format that is interesting for you, not some boring learning materials! 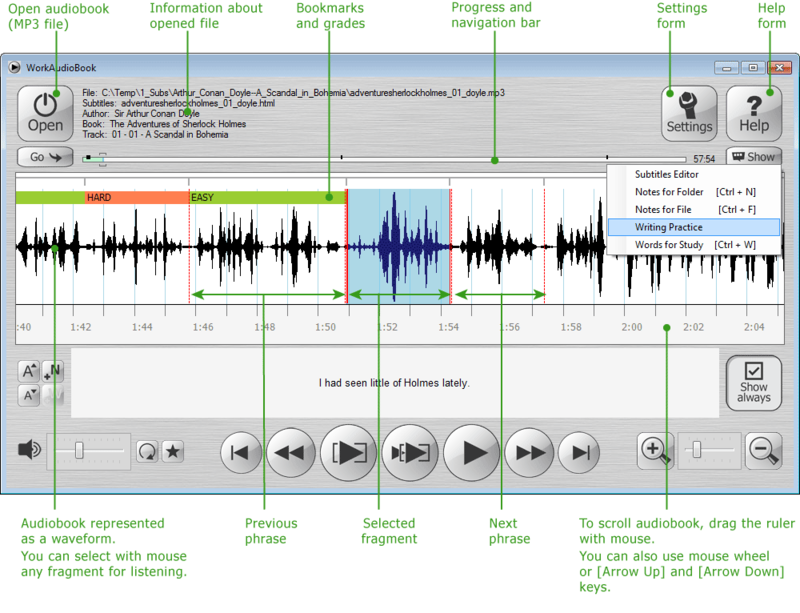 Application shows an audiobook as an audio waveform and lets you select by mouse any fragment of it for listening. But actually this isn't necessary, because the application itself searches for phrases very well. You can also correct current selected area: click inside the selection - and you'll decrease selection, click outside the selection - and you'll increase it. As you can see in the above screenshot, the application also shows boundaries of the phrases before and after the current one. "Play selected [Space]" and "Play next phrase [N]"
These commands are useful for those users, who follow the classical "listen and repeat" approach. This command is useful for the users with good skills in the foreign language, who rarely need to listen phrases repeatedly and who don't want to repeat phrases aloud (although we would suggest you do repeat them). Even in this case, application makes listening of audiobook in foreign language more convenient. Whenever you hear some unclear fragment – just press [Space] key to stop the playback and press it again to replay the last phrase. Also, you can set up auto-pauses (see below). After listening to a phrase you can pronounce it, and if you have a microphone, then listen to your pronunciation. 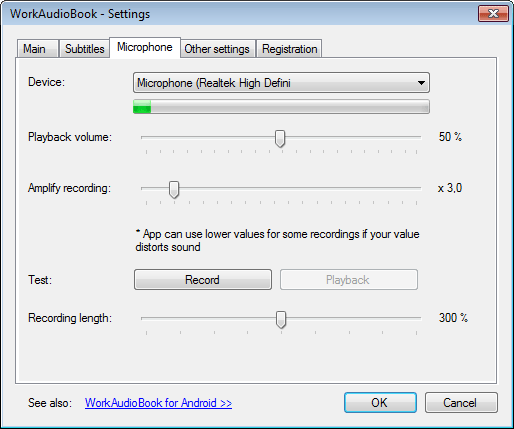 Change the settings and use "Record" and "Playback" buttons to be sure that the recording is of a desired volume. Click "OK" and return to the main window. Then listen to the current phrase with the "Play selected [Space]" button. After the current phrase is finished, you will see that on the right the microphone button became active. This means that recording is in the progress, and you can press this button or [M] key at any time to hear what you have said. If you haven't pressed the microphone button, then after a while the button will change its appearance. This means that the recording has finished. The recording time is the length of a phrase multiplied by the "Recording length" setting and in any case does not exceed one minute. Note that the recording from microphone is switched on only after listening to a phrase after clicking "Play selected [Space]" or "Play next phrase [N]" buttons, but not in the "Play nonstop [Ctrl-Space]" mode. Button "Show" opens menu with additional functions. Shortcuts. Please note that while the cursor is in a text field, you should press some hot keys together with Alt. For example, to play the next phrase you should press [Alt + N]. However, if you turn "Edit" off, then in Notes and Words for Study, you'll be able to press [N] without Alt. Here you can write out your favorite quotes, interesting idioms of a foreign language, list of characters in a book. It is convenient to copy a text of a corresponding chapter into "Notes for File", if this audio file has no subtitles. Notes are stored into the same folder as the MP3 file, so this folder must be writable (i.e. not on CD or DVD). This is a text box, where you can type what you hear. Application can check correctness, if you have subtitles, see Bookmarks and Grades. You can create subtitles yourself. If you don't have subtitles, then evaluate a result yourself by comparing your version with text of your book. When "AutoClear" is turned on application will clear the text box when you'll move on to the next phrase. You can gather a list of words that you want to repeat later. The application automatically sorts them when saving. You can add a word directly in the text box, but it is better to use the "Add new word" button - in this case the application checks whether the word is already in your list. The format of the list is simple: word = translation. You can then repeat these words as flashcards in Anki application. How to import words into Anki is described here. The application is very interesting, it uses spaced repetition learning technique. List of the words is stored into the same folder as the MP3 file, so this folder must be writable (i.e. not on CD or DVD). "Maximum phrase length" – to set maximum phrase length. "In 'Play Nonstop' mode: Pause between phrases" setting allows you to set up auto-pauses. "0 %" value turns auto-pauses off, a value greater than "0 %" specifies the length of auto-pauses. For example, if you set up a "200 %" value, then in "Play non-stop" mode the application will add a 16 seconds pause after an 8 second phrase, and only then move on to a next phrase. 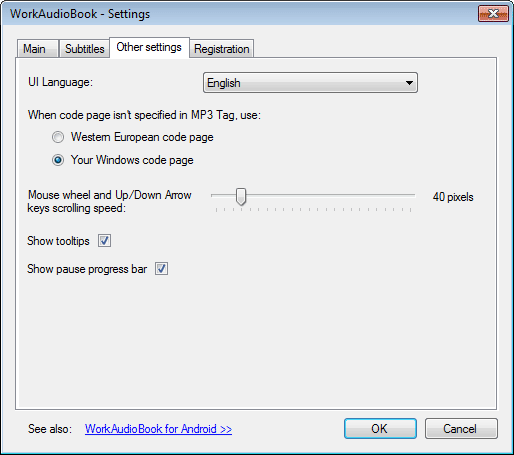 "When code page isn't specified in MP3 Tag" - if the book’s title or the author’s name shows as an unreadable text – try to change this setting. "Show Tooltips" - this option controls whether to show or not small pop-up hints for application’s buttons.